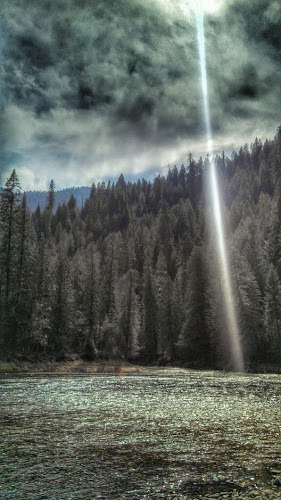 The Flyfishmagazine Blog: We hope the aliens practice "abduct and release"
We hope the aliens practice "abduct and release"
This photo, taken on the Selway River in Idaho by fellow fly fisher @Conky208, makes us think that aliens might have more than a passing interest in trout. I say? It's artistically done, with some drama, and quite possibly impeccable timing. Though I must say, if the aliens were beaming the trout into their ship's aquarium or whatever they might be using to transport the fish. They are missing out on the fun aspect of the art of fishing. Nothing beats the feeling of being an angler when there is an actual line being manipulated by your hand. Then, the reward for your hours of patience spent on waiting is the excitement and fulfillment when you reel in the catch. This is what fishing enthusiast at Charleston, South Carolina can't get enough of, and the reason why some go on weekend fishing adventures.